This past weekend was unproductively-productive. By that I mean Heather & I partook in some much needed & greatly appreciated down time. The only activities we participated in that could even be remotely considered constructive involved food - making food & then eating said food. 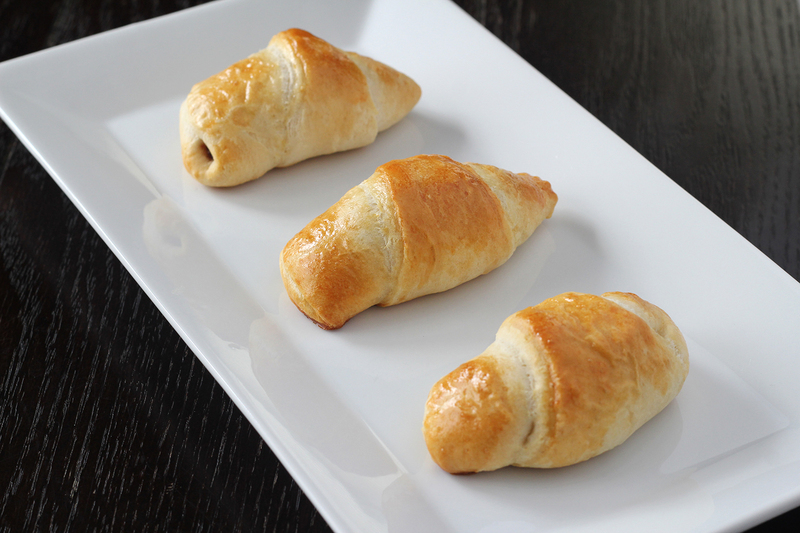 Part of our lazy-days menu included these super easy & cheap chocolate "croissants." I use the word croissant lightly, because it's more of a basic chocolate pastry. 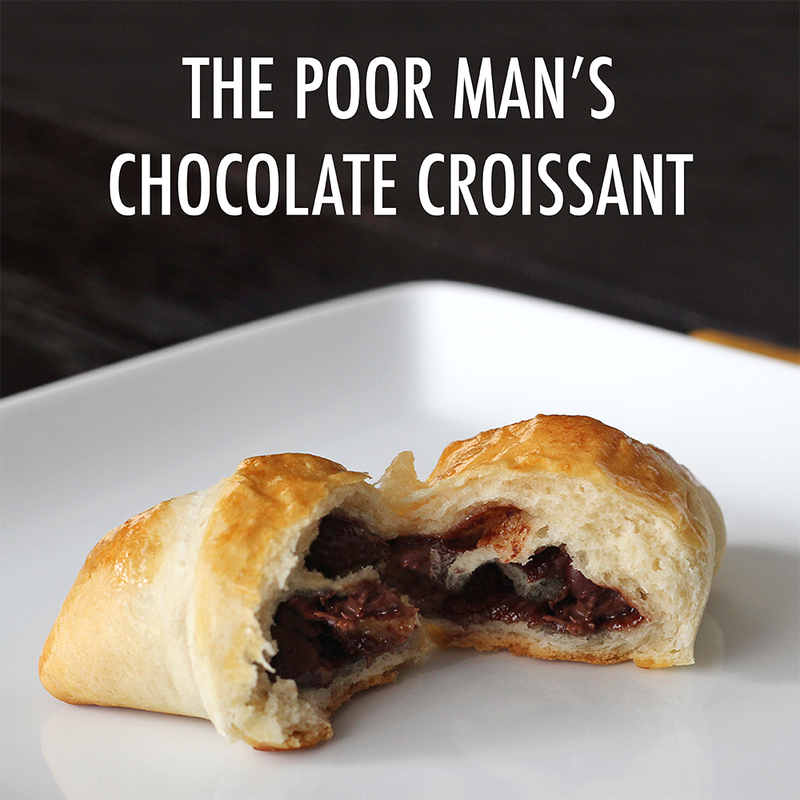 Don't get me wrong, it's delicious (it's chocolate & carbs, how could it go wrong? ), but I'm guessing that any native of France would be repulsed by this concoction. Regardless of it's no-frills simplicity, it does the trick in a pinch when you've got an insatiable craving for warm, gooey calories. Preheat oven to temperature indicated on crescent roll packaging. Pop open your can of crescent rolls & lay out your triangles. 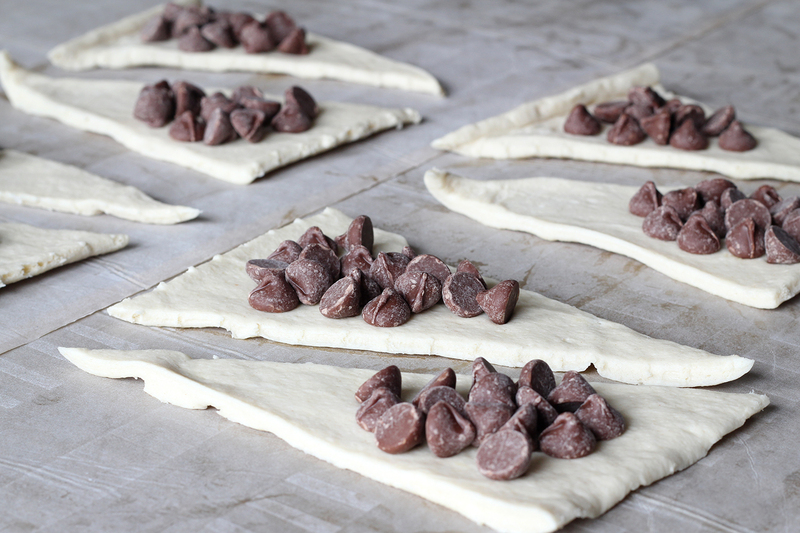 Place chocolate chips on each triangle & roll into a crescent shape - use as little or as much chocolate as desired. 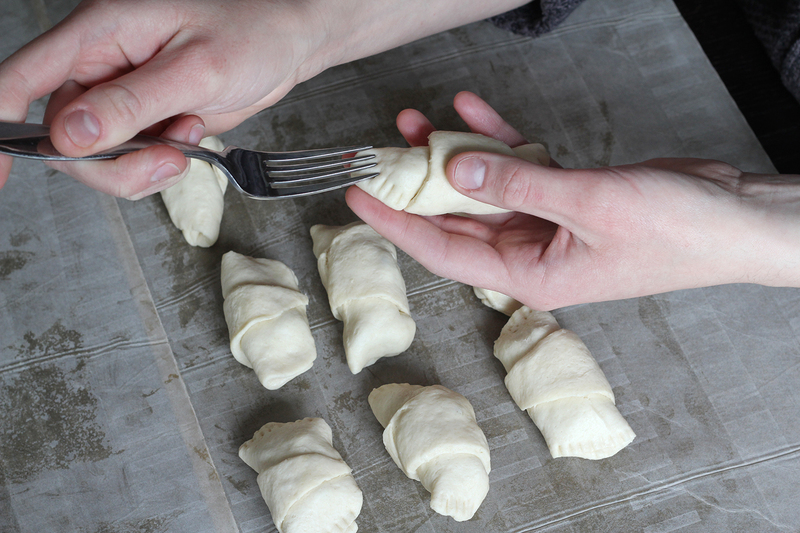 As long as your crescents can roll you're good to go. 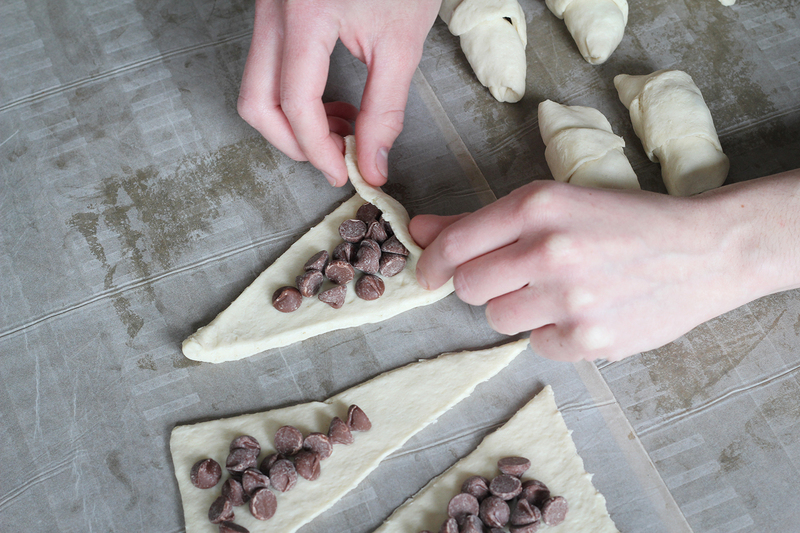 Using a fork, pinch the edges of the crescent roll together to keep the chocolate from melting out. Brush tops of pastries with beaten egg (if you don't have a kitchen brush you can use a paper towel). Place on greased baking sheet & bake for time indicated on packaging. Now that you've got your easy delicious snack, you're ready to binge-watch House of Cards. 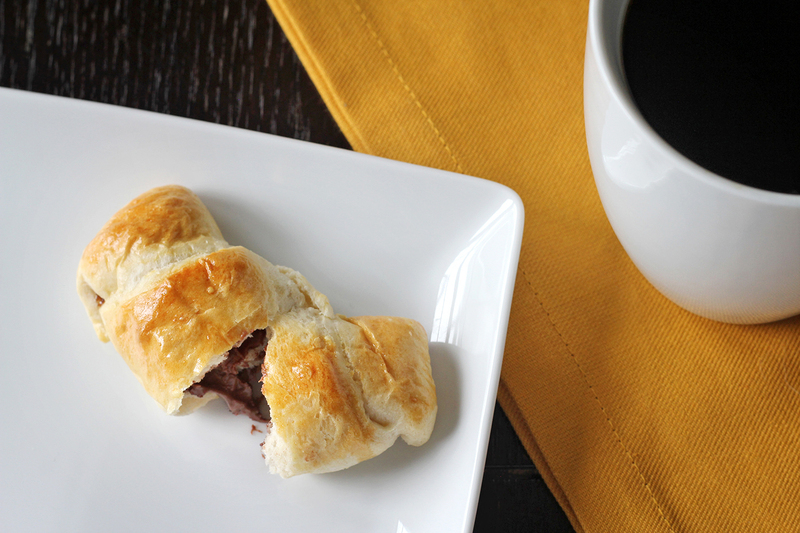 Related // I'm drinking coffee with my pastries, but they would also go well with hot cocoa if you're taking your chocolate consumption seriously. Simple + Yum = Get In My Belly!!! links i love // goodbye, hoopdie. hello, spring!